One of the trickiest challenges in the jewellery industry is providing clients with appraisals for period pieces made prior to 1950. Authentic pieces are becoming increasingly rare, while more and more copies of period jewellery are being manufactured and represented as the real thing. There are, however, several clues ‚Äì some obvious, some subtle ‚Äì that can help appraisers make an accurate assessment. Many factors need to be identified and evaluated to provide clients with a reasonable estimate. These include the circa date of manufacture; the condition, type, and quality of metal and gemstones used; and the relative quality of workmanship, signature, and design. It helps to be familiar with goldsmithing technology and its development over the past 150 years. This evolution is fairly easy to track. Most gems were set in silver or silver-topped gold until approximately 1895. Platinum or platinum-topped gold was used until 1930, while white gold came on the scene in 1918 (though it was used almost exclusively for pin backs until 1930). At that time, white gold began to be commonly used for the tops of designs as well. It stands to reason, therefore, that items made before 1918 could not contain white gold unless they‚Äôve been altered. 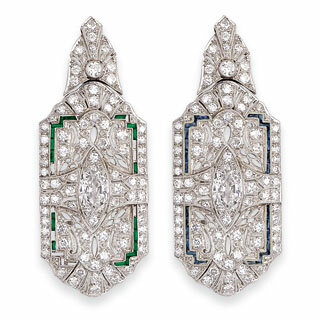 More clues to dating a period piece often lie in the cut of the gems, particularly when it comes to diamonds. For example, the old mine cut was used from the 1840s until the 1890s; the old European cut most often appeared in pieces made from 1890 to 1918; and the modern-day brilliant cut made its debut around 1919. 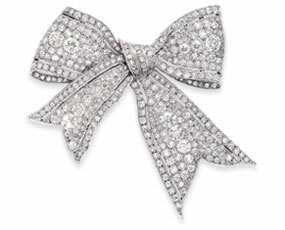 Diamond brooch with silver-topped and white gold back, entirely set with old European-cut diamond (1890-1918). The Design and workmanship are typical of the 1905-1915 period, yet due to the presence of white gold throughout the back, it could not have been made prior to 1919. Many pieces containing such old diamonds were made in 1940s, which is where the weight of evidence clearly places this piece. and set with calibre-cut sapphires. It is important all the clues point to a plausible circa date. If this isn’t the case, it could be an indication some parts have been altered or stones have been replaced. All too often, we see well-made or well-designed pieces altered in ways that employ different or inferior materials and workmanship. Additionally, in some cases, pin latches are modernized for greater security, and brooches are converted to pendants (or vice versa). Though this doesn’t necessarily impact the piece’s value, it is worth noting. Assay markings offer strong evidence of the age of a piece, since they are specific to certain countries and time periods. Upon close examination, some country and date marks are very similar to others, may be partially obscured, or are difficult to match with those listed in reference books. For England in particular, hallmarks are usually specific to the actual city and year. The amount of wear and tear on a period piece depends on the extent of its use or abuse, and may or may not correspond to its age. Some pieces may have seen a significant amount of wear, while others may have simply languished in a safety deposit box for decades. Also, certain owners are more careful with their jewellery than others. Using a loupe, be sure to inspect pieces for evidence of repairs or damage. Common repairs include the re-tipping of claws, strengthening of pins on the back of brooches, or resizing of ring shanks. More extensive repairs usually leave visible traces at the backs of settings. Bearing in mind the relative durability of the various materials or gems involved, it is best to judge whether the wear and tear is consistent throughout. considered novelty at the time. Although not always the easiest task, it is important to examine the quality of the workmanship and try and relate it to the standards of the decade in which you suspect the piece originates. An authentic signature is usually accompanied by a beautifully manufactured piece. In turn, suspicious signatures often feature below-standard workmanship and/or design. As in any other luxury goods market, you usually get what you pay for. True signature pieces are very tempting to copy, but have often been cleverly designed in ways that make the imitation all too obvious. While certain styles are easier to copy or mass produce, this can usually be detected on close inspection. Upon receiving an item for appraisal, I ask how long the client has owned the piece. This usually leads to a conversation that confirms, modifies, or contradicts the first impression and my initial inspection. Basing any decisions solely on a client‚Äôs memory is often unwise. The circa date of manufacture requires a careful examination of all types of clues ‚Äì the mounts, workmanship, design, and cut of the stones. Are the parts original or are there signs of alterations and/or replaced gemstones? All of these points should be outlined in the appraisal as they definitely impact the piece’s value. Fine jewellery styles tend to change markedly every five to ten years with some styles becoming classics that only change in their execution. As a result, a very experienced appraiser should be able to judge the age of a period piece within 10 years, with a relatively high degree of accuracy. What is the piece being appraised for? If the appraisal is being conducted for estate purposes, the average auction value is a good reference point for a period piece. However, if the appraisal is being done for insurance purposes only, the value should reflect the average price of similar items sold at major antique shops or jewellery store consignment counters. This quick overview is only a guide to appraising period pieces. Some items may appear challenging at first glance, warranting a second opinion from a fellow qualified professional. (likely rubies) has been replaced with synthetic white spinels, which have been used since the 1940s. The mount is stamped with a boar’s head signifying 950 silver, France 1838-1905.